Sanctification of persons, families and parish communities through growth in deeper prayer before our Eucharistic Lord. Why Exposition of the Blessed Sacrament? Has not Vatican II Forbidden Eucharistic Adoration? 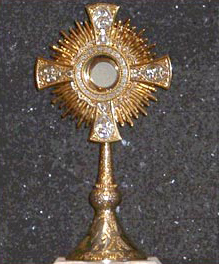 It has been the consistent belief of the Catholic Church from the very beginning that the bread and wine consecrated at Mass truly become the Body and Blood of Christ; and that, furthermore, as the Catholic Catechism states, this “Eucharistic presence of Christ [which] begins at the moment of the consecration...endures as long as the Eucharistic species subsist.” (CC #1377). In other words, the Eucharistic Christ then continues to be present in our midst beyond the Eucharistic liturgy when the consecrated host is either reposed in a tabernacle or exposed on the alter. If we can adore the Eucharistic presence of Christ when reposed in a tabernacle, why do we then need to expose the Blessed Sacrament on an altar? It is not essential for exposition to take place to have Eucharistic adoration, yet people report experiencing a greater sense of intimacy with Jesus and attentiveness of mind and heart to prayer when they are able to actually “see” our Eucharistic Lord. Moreover, according to Church regulations exposing the Blessed Sacrament for a period of time requires the presence of a sufficient number of people to be there and therefore fosters the commitment needed to establish and sustain a meaningful parish Eucharistic adoration program. But the best reason for having exposition of the Blessed Sacrament is simply that God wills it. During His Eucharistic discourse, Jesus made this unmistakably clear: “Indeed, this is the will of My Heavenly Father, that everyone who looks upon the Son, and believes in Him, shall have eternal life. Him I will raise up on the last day” (John 6:40). Vatican II sought to highlight the centrality of the liturgical celebration of the Mass and foster the faithful’s full participation in it. Some thought this meant doing away with Eucharistic adoration all together but the opposite is true. In his encyclical on the Eucharist, Mysterium Fidei, promulgated at the height of Vatican II on September 3, 1965, Pope Paul VI expresses his hope that “the restored sacred liturgy will bring forth abundant fruits of Eucharistic devotion, so that the Holy Church, under this saving sign of piety, may make daily progress toward perfect unity and may invite all Christians to unity of faith and of love, drawing them gently, thanks to the action of divine grace.” Experience has proven this to be true, for parishes which have established a long-term Eucharistic adoration program have over time seen an increase not only in the attendance at Mass but also in the sacrament of Reconciliation as well. And even though non-Catholics cannot receive the Eucharist at Mass, they can spend time before the Lord in Eucharistic adoration and through His Eucharistic presence felt spiritually do oftentimes seek full communion with the Church so that they may also participate fully in the liturgical celebration of the Mass. What is the Difference between Perpetual and Non-Perpetual Adoration? Perpetual Adoration is a Eucharistic devotion whereby members of a given parish (or some other entity) unite in making continuous hours of adoration before the Blessed Sacrament both during the day and throughout the night, seven days a week. Non-Perpetual Adoration is adoration of the Blessed Sacrament less than 24 hours a day, seven days a week. Perpetual Adoration, whenever possible, is to be preferred because it offers individuals the convenience of adoring Our Lord at any and all hours of the day and night and mobilizes the maximum number of individuals committed to prayer. Consequently, it is to be considered the goal of all parish Eucharistic adoration programs. Is not Perpetual Eucharistic Adoration in a Parish Forbidden by Church Laws? Will not Focus on Christ’s Presence in the Consecrated Host Eclipse People’s Awareness of His Presence in Each Other and the Community as a Whole? It is true that the Eucharist is not the only modality of Christ’s presence to us. As the Catechism of the Catholic Church states “Christ Jesus… is present in many ways to his Church: in his word, in his Church’s prayer…, in the poor, the sick, and the imprisoned, in the sacraments of which he is the author, in the sacrifice of the Mass, and in the person of the minister. But “he is present… most especially in the Eucharistic species” (Catechism, 1373) for therein “the whole Christ is truly, really, and substantially contained” (Catechism, 1374). It is precisely this mode of Christ’s presence offered in atonement for our sins and “remembered” in this sacrificial meal which raises the Eucharist above all other sacraments as “the perfection of the spiritual life and the end to which all the sacraments tend” (Catechism, 1375). In other words, Christ is present in the Eucharist par excellence precisely because the Eucharist becomes the means by which he is able to establish his presence in every other experience of the Church’s life and ministry and in its members. Rather than eclipsing his presence in all other ways, the Eucharist first celebrated, consumed and then adored becomes the means by which that presence is established and enhanced. This has been the conviction and personal experience of all who have possessed a true understanding and love for the Eucharist in the past and it continues to be the conviction and experience of all who do so today. Will not Eucharistic Adoration foster a type of a Privatized Spirituality that places exclusive focus on personal growth over social concern? A true concern for society (i.e. welfare of the poor, issues of peace and justice, evangelization) is a byproduct of the strength of one’s own prayer life and personal dedication to Christ. Eucharistic Adoration fosters such a genuine sense of conversion from over preoccupation with one’s own will to the embrace of Christ’s will for oneself and others. Consequently, rather than being a deterrent to the social mandate of the Church, it provides the foundation upon which a genuine commitment to Gospel service and evangelization can be built. How Much Time and Money will it Require to Establish Eucharistic Adoration? Eucharistic Adoration is a lay-run ministry. As such it supports the call of Vatican II to promote the involvement of the laity in the mission of the Church. Consequently, once established, outside of his occasional pulpit support and offering of spiritual guidance when needed, very little time will be demanded of the pastor. Experience has also shown that the laity tend to be very generous in financially supporting ministries they see as directly benefiting them and their families. As a result, whatever expenses are needed also tend to be provided for by the lay people themselves. © 2002 Fr. John P. Grigus, O.F.M. Conv.